Electrical Conduit Market size in 2017 exceeded USD 5 billion and is anticipated to grow at a rate of over 8% by 2024. Growing measures to curb fire, health, electrical supply faults and other operational hazards coupled with favourable regulatory reforms pertaining to upgradation of standardized product specifications will boost the global electrical conduit market. Lack of effective electrical infrastructure across the developing nations along with ongoing retrofit of existing electric networks across developed nations will integrate a favourable business scenario. Furthermore, increasing R&D investments from leading participants to expand and enhance the product portfolio with an aim to incorporate a versatile technological platform will act as a breakthrough. As smart grid networks penetrate the industrial peripherals, restructuring of the existing infrastructure require safe and secure operations which in turn will foster the electrical conduit market growth. In addition, these products add to the aesthetic feature of the internal environment across commercial and residential establishments which will sustain the product demand. Henceforth, positive consumer and installer inclination towards safe and secure electricity supply supported by aesthetic proximity will augment the overall industry share. ½ to 1 trade size electrical conduit market share is anticipated to grow over 8% by 2024. Rapid expansion of low – voltage distribution networks across commercial and residential establishments have gratified the low trade size industry growth. Flexible product configurations and aesthetic proximity are the key parameters complementing the product demand. In the recent years, 1 ¼ to 3 trade size conduits have gained upsurge owing to large-scale commercial expansion and revamping of small-scale industrial platforms across developing economies. In addition, suburban migration has further led to the development of large multi-story residential complexes and apartments, driving the overall electrical conduit market share. 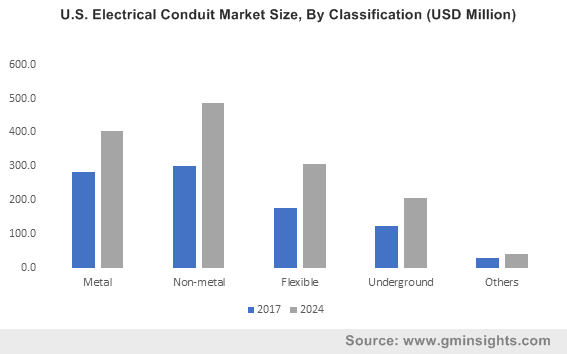 Extensive power distribution network across large mining & metal industries coupled with high end dependency on railway infrastructure will augment the metal electrical conduit market. Although the introduction of effective flexible and non – metallic conduit technologies have hampered the industry growth, however, standard product specifications favoured by high cost of replacement across the large-scale applications will sustain the overall business landscape. Non – metal electrical conduits in the current industrial regime have gained eminence on account of their product flexibility and varied applicability across electricity distribution networks. With increasing acceptance, industry participants and manufacturers have shifted their focus on the development and sustainable supply of the products. Henceforth, positive consumer tendencies, product versatality favoured by cost efficient configuration will thrust the industry landscape. The construction of facilities, tracks, support infrastructure, engineering, R&D, and the production of communications & signalling equipment will extensively favour the industry growth. Growing dependency on manufactured goods in line with rapid urbanization across developing nations has been among the primal elements of the overall manufacturing and industrial sectors. Rising demand for electricity from the shipbuilding industry along with large-scale process plants have integrated a favourable business landscape. Precision work undertaken across the various industries along with advancing product specifications will positively impact the overall conduit market share. Furthermore, growing aesthetic proximity in line with the growing demand for flexible wire & cable management systems will further fuel the industry potential. The residential & commercial applications in 2017 cumulatively accounted for over 50% of the global electrical conduit market share. Rapid urbanization coupled with favourable regulatory renewable schemes across residential establishments will complement the industry outlook. Enhancing on-site electricity generation technologies along with the ongoing smart control networking schemes will further escalate the product demand. 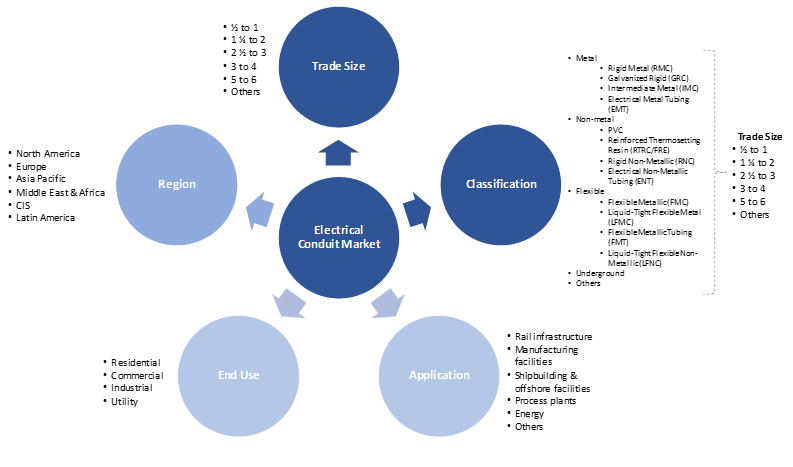 Increasing emphasis on the integration of varied frequency distribution networks along with growing concerns for energy-efficient operational environment will stimulate the industrial electrical conduit market size. The rising demand for ultra-high voltage networks along with increasing investments by private and government organizations in line with the electrification programs across developing regions will further complement the industry growth. The U.S. electrical conduit market is projected to value over USD 1 billion by 2024. Growing focus towards the replacement of the traditional electrical equipment with enhanced high-quality systems will further fuel the product demand. The U.S. Government in 2018, has framed plans to invest USD 10 billion to develop new electric networks, with an aim to decrease the curtailment rate across the Western Transmission Network. Asia Pacific will observe growth subject to the increasing electricity demand from emerging economies. Developing nations including India are considered as favourable spots as they continue to augment the existing power capacities and infrastructure to meet the electricity demand. The Government of India also launched “One Nation-One Grid-One Price” program in 2016 to interlink all state and national grids to achieve a single tariff structure throughout the nation. Prominent electrical conduit market players comprise of ABB, Schneider, Hubbell, Aliaxis, Astral, Atkore, Hellermann Tyton, Legrand, Mexichem, Champion Fiberglass, Electri-Flex, Wienerberger, Cantex, ANAMET and Zekelman. Shifting trends in energy-efficient technologies along with growing investments toward the deployment of high-capacity alternative energy sources have been the key strategic implications adhered by the leading industry participants. Electrical conduit is a tube used for protection and routing electrical wiring in a structure or building. It is made up of different materials including metal, plastic, fired clay or fiber. Majority of conduits are rigid but flexible conduits are also used for various purpose.